In theory, transit is a big melting pot where people from all walks of life rub elbows. That may be close to the truth in some places, but in others the reality is often quite different. People riding city buses to work probably aren’t as affluent as the people riding the commuter rail line into downtown. Indeed, what Americans call commuter rail is, arguably, a fundamentally inequitable mode reliant on social exclusion. It’s a high-cost service whose fares are frequently unintegrated with other forms of transit and that runs only frequently enough to be useful to those who have significant flexibility in their schedule, or the privilege to define their own time management. But it has a powerful constituency that keeps it going — and just functional enough to suit their needs. 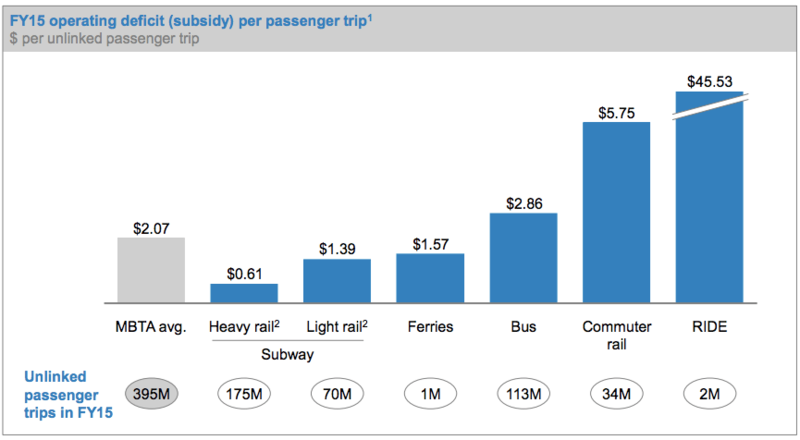 For example, there’s been a ton of talk in the Boston area about cuts to the MBTA — but, while expansion may be slowed some, there’s been little talk of cuts to commuter rail, even though it’s by far the most highly subsidized of the agency’s modes on a per-ride basis. In a nutshell, this is why my senior paper research focuses on making commuter rail more egalitarian. The fundamental inequity of American transportation policy is the privileging of automobile use and abuse over everything else, but too much of the inegalitarian stratification that defined transit before World War II still persists. Indeed, in some ways it may have gotten worse. And that’s something planners and transit advocates need to address. Elsewhere on the Network today: Greater Greater Washington explains how snow events expose weaknesses in suburban transportation systems in particular. Green Caltrain reports that a proposed transportation sales tax will raise money for freeway widening in Santa Clara County, undermining efforts to limit solo car commuting. And Green City Blue Lake offers 10 ways the Cleveland region is well-positioned to transition to a more sustainable transportation system. What If “Commuter Rail” Was for Everyone, Not Just 9-to-5 Commuters? Commuter rail in the United States mostly caters to affluent suburbanites who commute to the city center. Even though these lines pass through working class city neighborhoods that stand to benefit enormously from better transit, the service they provide passes those communities by. It doesn't have to be that way. A new report from Manhattan Institute senior fellow Aaron Renn argues that the federal government should stop supporting new rail lines in cities across the country.